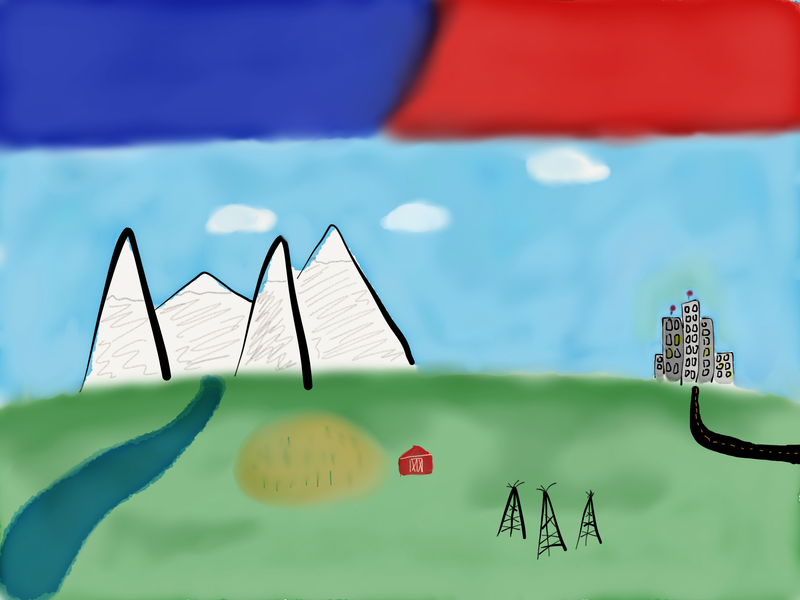 Two years ago I wrote a post titled Are the Poles Actually Growing. It had nothing to do with environmental change and had everything to do with widening positions on issues – which may actually include the Earth’s climate. My point was that the extremes on issues were getting the most mindshare and that those who had positions which weren’t at the fringes weren’t being heard. This was just after the Newtown school shootings and I saw it politicized more than mourned. It was a tragic event which should have brought people together but drove them apart. I quit social media for a while because it made me ill. After two years, where are we now? Today it seems to me that we’re further apart than ever. Lately I’ve been experimenting with bringing up some current event topics on social media. This has been partially as an experiment and partially because I’ve had feelings about them which I’ve wanted to discuss. What I’ve found is a bit of discourse (thank you) and more finger pointing. Quite often the defense for a position is to say that the other guy is doing the same thing or worse. They’re making up news. They’re out to take my money. They don’t care about the planet. They want to destroy the economy. They’re all out to get us. But that doesn’t make you right. It just means that you’re putting the other side of an viewpoint on the other side of a fence. A fence which you’re not willing to cross or even have a dialog across. What we’re seeing is more divisive reporting of the news which verges on entertainment and opinion more than fact. We’re seeing it affect our government and our elections. We’re spewing it back in peoples’ faces. The more tiresome it becomes, the louder the voices shout to make themselves heard. How can those who agree still disagree so much? A recent story I saw online points to this . 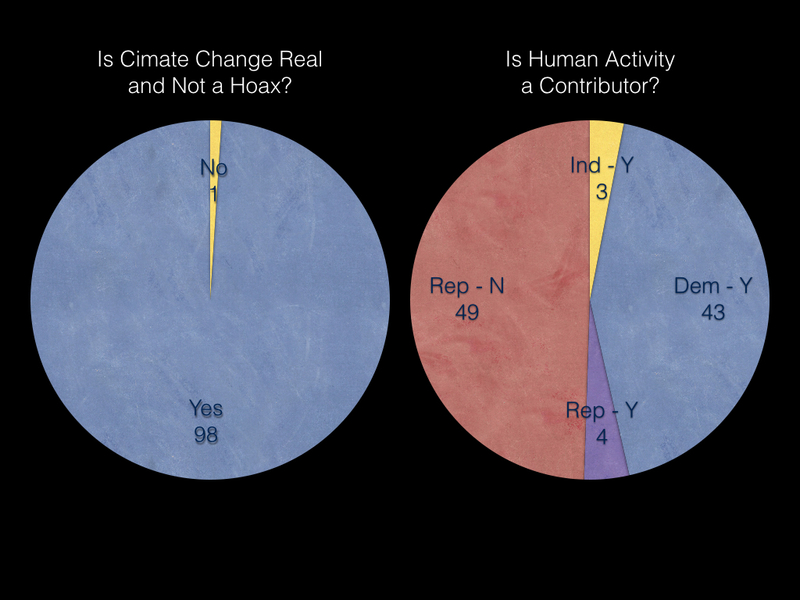 The Senate held a vote to see how many of them believed climate change was real and not a hoax. All but one senator present voted yes. The next vote was to see who believed whether human activity is a significant contributor to it. You can see the results above – it’s almost entirely split by party lines. Try posting this on social media and see what happens. My group wants to save the planet and yours is bought. Yours is bought just as much as ours. Your group can’t really prove your point because we’ve got scientists who say otherwise. How can it be possible to arrive at any policy when there’s such a split? Pick the topic: the environment, gun rights, foreign policy, social programs, education, religion’s role in society, racial relations, name one. You’ll find divisiveness on all of them with stances scoffed at and supporting media posts on all fronts. There’s precious little discourse and you almost always identify what someone’s position is based on what color the sky is on their planet – red or blue. If you ask me about any of these, you’ll find I’m fiscally conservative and socially liberal. I’ll vote either side of a ballot and I try to see both sides of an issue. I have one huge bias though. If your knee-jerk reaction is defensive, not based on objective thought, and is only concerned with your own interest then you’ve lost me. My bias is against bias. It tends to get us nowhere and is a waste of time. Just like the Senate vote. You made it this far. This is my closing point. Take the chance to reevaluate yourself and your beliefs. Not just once, but often. There is no real discourse with agendas that are hard and fast. There is no progress. Problems stay problems and the interests of those willing to compromise are not served. Have some empathy and flexibility and start making the world a better place one person at a time. Awesome post, Eric. I know we have these conversations often when going riding. All it takes for progress is for people to be more open minded and be open to to seeing others opinions as valuable, whether you agree with them or not. Thanks, Marty. That’s what I’m going for. In the two years since I wrote that last piece it feels like things have changed. It used to take something like the Newtown killings to incite matters. Now it’s almost anything. Think back to Newtown. Can you even remember anything being said about access to guns by the mentally ill? It was more whether the answer was to limit access to the population in general vs. oh no you’re not. And zero has changed except more incidents.